By Peter Anderson 16 Comments - The content of this website often contains affiliate links and I may be compensated if you buy through those links (at no cost to you!). Learn more about how we make money. Last edited February 10, 2014 . In case you've been living under a rock and haven't heard, personal finance bloggers will now have their own blog conference to attend. It's called The Financial Blogger Conference, or FinBlogCon for short. It will be held in Chicago this year on October 1st-2nd. What Will Be Happening At The Conference? 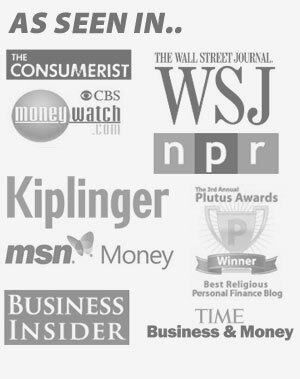 So Why Should You Go To The Financial Blogger Conference? and of course me… and hopefully you'll be there too! So, the list of bloggers that are coming to the event is growing, and you don't want to miss out! So who is the conference for? If you're in one of the groups above, you don't want to miss out on this event! There will be a variety of sessions at the conference, and the final details are still being hashed out. But it currently looks like there will be a social/mixer on Friday night for everyone to get together and meet. Personally I'm looking forward to this because I've been talking with a lot of these folks for over 3 years, but never met in person. Then on Saturday and Sunday there will be tons of sessions with a couple of keynote speakers, sessions with experienced personal finance bloggers and industry professionals, expert panels with Q&A time, and breakout sessions where a variety of topics will be covered. So if you're not already convinced to attend, here are a few more reasons why you should be going to FinBlogCon. You love personal finance and blogging. You want to learn about new products and services in the financial industry. Like me, you want to meet blogging friends face to face and network. Blogging is all about relationships and working together! So you can say you were there at the first annual FinBlogCon! 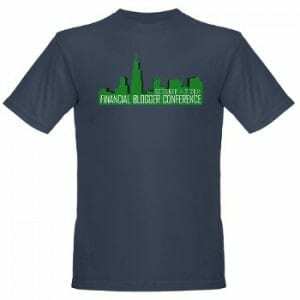 If those reasons aren't enough, if you register today and buy your ticket through my link below – I'll also be giving away one custom made extra large Financial Blogger Conference T-shirt (see photo). I was honored to do the design for this year's conference website and promo materials through my design site logosforwebsites.com. After doing the design I made myself a couple of custom conference t-shirts, one to keep and one to give away. To win the shirt just be the first person to buy your ticket through my link and email me with your payment confirmation. Once I confirm that a purchase was made through my link, I'll get your name and address and send out your t-shirt! I am just starting my journey in the personal finance blogging world but how do I get groupies? I need to know now! If I grow a mullet and wear tight leather pants will that help me get groupies? Please let me know what it takes to get groupies! No clue what it takes as I have none of my own.. but let me know if you find out! Skinny jeans are not much different tight leather pants so maybe there is a chance. Mullets already have a cult following. I am so money, groupies here I come!!! I’ll be at the conference – looking forward to meeting everyone and learning a few things too! Nice job with the logo! Look forward to meeting you Tim! I can’t believe I wasn’t on the list:). JK! I wanted to add there will be female PF bloggers there as well. Of course I look forward to meeting you as well! There will be a ton of great male and female bloggers there, and I can’t wait! as you mentioned I will be there! Looking forward to seeing your tall-blondness there in person! Heh.. I look forward to meeting you as well Bob.. You’re one of my “blogging Godfathers” so to speak, one of the first Christian finance blogs I ever read, so it’ll be nice to finally meet you in person. Not sure I can make it yet, but I never would have guess that your voice would have sounded like that…kind of weird putting a voice to the face. I have to admit – i always feel weird when i hear my own voice. I know what you mean, i’ve talked to a few bloggers recently that I’ve known for a while, and it’s kinda weird to finally hear their voice..
Can’t wait to meet you in Chicago, Pete! You too Ryan, it’s gonna be fun to finally meet! It’s going to be a blast I’m sure. 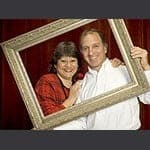 Looking forward to meeting you and all our other blogging friends in person. Finally! This conference looks amazing! Definitely hope I can make it! And score a sweet new t-shirt!